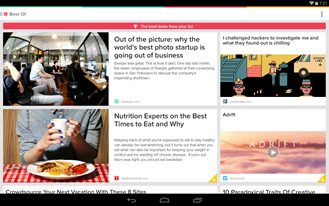 After its update to 5.0 on iOS about a week ago, Pocket has been upgraded for Android as well. I'm a long-time user of Pocket, and while my use case is probably different from the typical user's (there are probably only about 10 items in my list at any given time), it's clear to me that Pocket is always trying to find new ways to make simple save-and-read functionality better and more convenient. To that end, Pocket's new update offers users a new "Highlights" selection, which will pull and organize the best stories from your list, placing them in categories like "quick reads," or sorting by source, trending status, or subject matter (like "#photography"). Pocket says that the highlights feature can learn and adapt to your habits in the app, making for better selections. 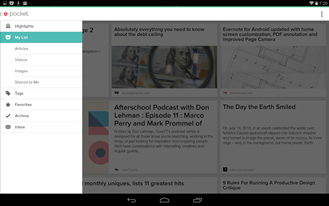 Pocket's navigation has also received a facelift, moving to the slide-out hamburger menu style, with slick animations for loading, drawer opening, and the secondary "highlights" drawer. Pocket also says that search has been improved, and is sure to tout the update's functionality with Pocket Preferences, a new feature that will allow connected apps (like Zite and Hack Later) to further improve your pocket experience. With Pocket Preferences, there is no longer a need to manually configure your content categories or import a set of RSS feeds like in the days of Google Reader. 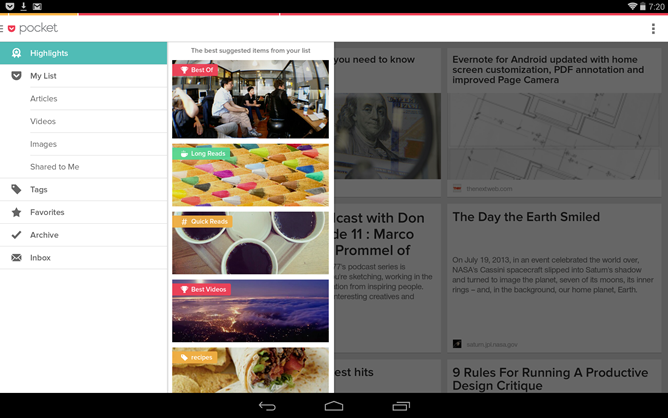 The topics, sites and authors you save most to Pocket are now portable, and can be shared with other apps automatically. 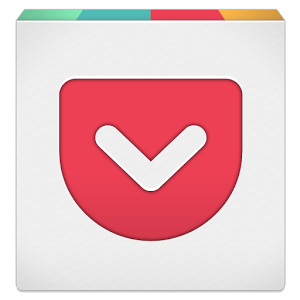 In other words, Pocket can share the types of things you save to Pocket with other apps, allowing them to make suggestions based on that content. So far only a couple of services have hooked in, but Pocket is offering the chance for developers to get early access at its blog. If you haven't already, hit the widget below to grab the update.